In the United States, we tend to be hard on ourselves about our rate of biking to work compared to Europe. However, we have reason to celebrate during this Bike to Work month. In America, the ranks of cycling commuters are only growing: our numbers rose about 60 percent throughout the aughts, from 488,000 bike commuters in the year 2000 to roughly 786,000 in 2008–2012, according to the US Census. More recently, biking to work has continued to trend upwards from 2006 to 2013 among workers of all income brackets. Although our patterns of bike commuting are looking rosy, we in the United States still have plenty to learn from Europe so that everyday people cycle as a matter of habit across the nation. Here’s how pedaling commuters get to work in style in the two cities with some of the highest rates of bicycling. In Copenhagen, almost half of the population cycles to their school or office. We can glean some infrastructure lessons—as well as style tips—from Denmark’s bike to work culture. Only one percent of Copenhageners mention the environment as the reason they ride. Most of them do it because it’s the easiest way to scoot around town. 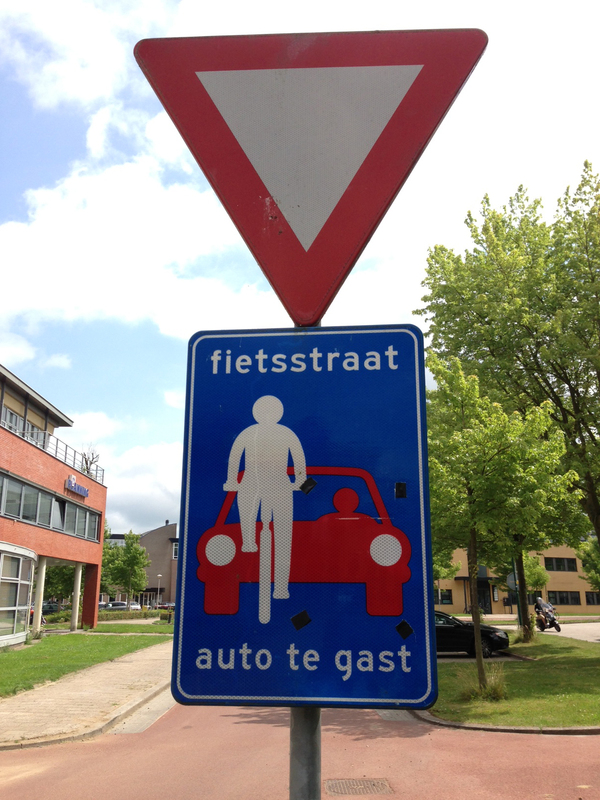 Strong cycling infrastructure makes the choice obvious. Traffic lights are coordinated for bicycles, not cars. When it snows, bike lanes have priority for cleaning before roads. No wonder the majority of commuters still cycle through Copenhagen’s white winters. City planners made bike lanes the most direct routes to the city center, according to the Guardian. Copenhageners prefer bike baskets, storing their work supplies in a way that keeps the burden off their backs. Personalizing the baskets with flowers and stickers gives cyclists a personal connection with their ride. The baskets can be easily taken off the front handlebars, allowing for shopping and moving around. Comfy saddles are standard. Brooks leather saddles can be seen around Copenhagen. About 63 percent of Amsterdammers bike every day. Cycling to work is in their DNA. Here’s how it happened. Dutch bike lanes are wide enough to allow for side-by-side biking, according to the BBC, allowing you to chat with your “bikepool” buddy. Many cycling routes are offset from cars and the rest of the road, making commuters feel safe. Image by TCP via flickr. Dutch children start biking as babies in cargo bikes, called bakfiets in Dutch. Bikers don’t consider cycling a lifestyle choice. Rather, it’s a default mode. As such, their bikes aren’t consumer accessories to show off a subculture, but workaday vehicles, according to the BBC. In such a culture, cycling might seem more accessible to the rich and poor alike. Sliding wheel locks allow for cyclists to quickly secure their bike and hop into the coffee shop on their ride to work. Popular dynamo headlights are powered by pedaling—so you don’t have to remember to recharge them or replace the batteries. Commuters bike to work in skirts and heels like it ain’t no thang, thanks to the predominance of Dutch-style step-through bikes. Seeing others do it all the time makes it seem natural… so why not start the trend in your city? Increasing the number of bike commuters in the United States will have to be a joint effort between policymakers and the people on the streets. Start today to create the cycling culture you’d like to live in: Write a letter to your local representative to prioritize bike infrastructure. Then, slip on your high heeled shoes, put your laptop in your bike basket, and cycle to work with a smile. You might inspire someone else to do the same. PUBLIC is proud to support Black Girls Do Bike and their efforts to promote healthier lifestyles. We interview founder Monica Garrison below. Also learn more about the upcoming June 10-12 Black Girls Do Bike’s first National Event in Atlanta. What was the inspiration behind launching Black Girls Do Bike? Tell us about coming up with the name. The inspiration came after re-discovering how much I enjoyed the simple act of riding my bike in the spring and summer of 2013. I was reaping the physical and mental benefits and my children were joining me and learning to survive without their electronic devices. In my travels I quickly realized that there were very few women who looked like me out riding. BlackGirlsDoBike.com was an attempt to seek out like minded women who had a passion for cycling but also to inspire those bike-curious lady who were just an obstacle away from cycling regularly. I chose to state it in the affirmative, “Black girls do bike!” as if to say that each time a women of color takes a ride she is reaffirming this truth to herself and to others. Tell us more how Black Girls Do Bike is currently structured across the country and how volunteer leaders communicate and support each other? Each of our chapters is led by a lady volunteer who we affectionately call a Shero. Each Shero at some point reached out to me with a desire to encourage more women in their community to ride bicycles. They lead rides, moderate their city’s individual Facebook group pages, network with local bike shops and bike/ped organizations and seek to be an overall voice of positivity and encouragement. Internally all of our Sheroes are part of a secret Facebook group that we use to support one another in this endeavor. We offer praise, advice, frustrations and suggestions for success. We also have a Shero only password protected website with all the need to know stuff. What has surprised you about the being recognized and involved as a voice in the national bicycle advocacy movement? The funny thing is that 4 years ago I didn’t even own a bike and had never participated in an organized bike ride of any sort. What I had was a desire to ride and that has set me on a truly life changing journey. It has been such a whirlwind for the past couple of years to be at the helm of such an amazing organization. Now I find myself mentioned as a voice in the national bike advocacy movement. I am much more comfortable being considered a voice in the national women’s advocacy movement. Either way we are busy in the work of empowering women with the help of bicycles. Tell us about your upcoming June 10-12 National Meetup “We Ride Together” in Atlanta? What do you hope to accomplish? Our main goal is to make a mark on the Atlanta Tour De Cure by having a large presence and raising a lot of money for a great cause. Diabetes affects African American families and specifically AA women at disproportionately high rates so for many of us this is personal. We chose Atlanta as the spot for our first national meetup as our chapter there is our largest with more than 1200 supporters. The weekend will consist of three days of bike related events. REI CoOp has pitched in to help with the needs of our ladies who are traveling in from out of town and will need their bikes assembled. Civil Bikes has offered our members discounted rates on bike related historic tours around the city. The weekend will end with a celebration in the form of a relaxed recovery ride along the Atlanta Beltline. We will end up at Piedmont Park with a luncheon and festivities to be held at the beautiful Magnolia Hall. We have more than 15 sponsors so our giveaways at this event will be epic. Some of the main reasons people cite that they don’t bike is that they perceive it as an unsafe or inaccessible activity — dangerous public streets, not enough protected bicycle infrastructure, access to trails and bike paths is far and too infrequent. Are there other obstacles – perceived or real – that you think are specific to encourage more women of color to get on a bike? I believe there are many points of overlap in terms of why people shy away from riding bikes. Many women of color are overweight or obese and those with negative body image issues are less likely to try a new form of exercise with people they don’t know or trust. Our offer to include riders of all levels in our groups rides, which are “no women left behind”, can help those who might not want to tackle new and unfamiliar activity on their own. A friendly Shero who is willing to accompany a new rider to the local bike shop and help her navigate decisions of what type of bike and accessories to purchase can be invaluable. Surprising many women did not learn to ride in childhood so they are even more apprehensive to start as an adult. What’s next for Black Girls Do Bike after the National Meetup? What other initiatives, events, and partnerships are you looking forward to? We are also working on a process to have all of our leadership formerly become certified ride leaders by developing our own course or taking advantage of an education program already in place. We have been contacted by some big names in the cycling community who want to help us further the reach and mission of BGDB. So we plan to pursue those leads and form some strategic partnerships. I like the idea of having BGDB ladies from all over the country converge on different cycling events to increase our visibility. Events like NYC’s 5 Boro Bike Tour, Alabama’s Bo Bikes Bama, Maryland’s Seagull Century the Tour de Cure series and many more. If our national meet up this June does what it seeks to accomplish, we may make this a biennial event. Maybe you’re on the hunt for just the right bike helmet, or perhaps you’re already rocking the one you love. Whatever the case may be, these four factors from the Snell Foundation should be taken into consideration whether you’re buying your first helmet and/or ensuring that the one you have fits properly. 2. COMFORT. Imagine wearing your bike helmet for hours, and ask yourself if you’d still be comfortable. Does it have enough ventilation? High-quality ventilation will increase the price of your helmet, but if it’ll encourage you to wear your helmet and bike more, it could be worth it. Do you feel any pinching? Better yet: Test drive your helmet for as long as possible, and see how it feels over time. 3. STYLE. If you look like a motorcycle cop in your helmet, you might not be as psyched about riding your bike. Pick a bike helmet that makes you smile so that you’ll want to wear it. Search for colors and patterns that suit your vibes or coordinate with your wardrobe. 4. SAFETY. The materials in your helmet deteriorate. Your sweat and hair oils erode at the glues and resins in your gear. To make sure your helmet is protecting you to its fullest, you should replace it every five years, according to the helmet safety nonprofit Snell Foundation. Check the age of your own helmet by looking for the manufacturing date, usually found on a sticker on the inside of your helmet. Your pick of helmet is a personal choice. Just keep it fresh, and you’ll be good to pedal for five more years! In honor of our first-ever PUBLIC SoCal store that opened earlier this year at 2714 Main Street in Santa Monica, we partnered with DAPPER DAY to give away a very special custom DAPPER DAY + PUBLIC Bike. And we’re happier than the happiest place on earth to announce that the winner of the DAPPER DAY x PUBLIC Bikes Giveaway Contest is Alejandra from Los Angeles. Alejandra says she “couldn’t be more excited” about her new bike. She used to spend her Sunday afternoons in college “biking down to Dockweiler Beach, exploring Manhattan Beach, making my way over to Hermosa Beach and Redondo Beach, and enjoying the sunshine on my way back home.” And now with this new PUBLIC bike, she’ll be able to fill her Sunday afternoons with beach bound rides again. Some of Alejandra’s hobbies include sewing and crafting, and she loves dressing in vintage-inspired wear. We think her new Dapper Day + PUBLIC bike will compliment her vintage-style quite perfectly. Big thanks to all who entered and sign up for our e-newsletter to hear about our next giveaway! For adults we think riding a bicycle with or without a helmet is a personal choice. This personal decision should be based on the surrounding riding conditions, the rider’s age and experience, the type of riding the person is doing, and someone’s general overall risk assessment. If you’re choosing to wear a bicycle helmet, read our helpful bicycle helmet safety tips on fit and comfort – and why you should replace your helmet every five years. There’s a lot already written on the heated topic of whether riders should wear a bicycle helmet, and even if laws should mandate wearing a helmet. Although there’s no federal law mandating that bicycle riders strap a shell on their noggins, 22 states have laws regarding bike helmets. Instead of spending energy debating a personal choice of whether to wear a helmet, we think it’s more important that we, collectively, advocate for safer and better bicycle infrastructure to encourage more people to get on bikes. We believe changing the riding conditions in our cities to make bicycling safer – more protected and separated bike lanes, lower speed limits for everyone, and better designed streets for all mobilities – will ultimately do more to protect riders. In one of the safest cycling countries in the world, the Netherlands, riders rarely wear helmets, according to Co.Exist. That’s because the country’s infrastructure prioritizes cyclists, and as a result, that gear becomes almost superfluous. In countries like the US and UK, having to wear helmets might be a “failure of policy,” according to the British blog Alternative Department for Transport. On Mother’s Day, there are countless reasons our moms deserve handwritten cards and brunch. For some of us, those reasons include our fond memories of learning to ride a bike. Our mothers patiently guided us as we graduated from child bike seat to balance bike to kid bike with pedals. Just by watching Mom pedal around town herself, some of us learned to value biking for its exercise, convenience and fun factor. For all those new mothers hoping to shape their children into cyclists, we salute you. Our figurative flowers for you include tips for teaching your kids the rituals of biking. Aside from the obvious habits that apply to all ages—wear a helmet, use hand signals, bike on the right side of the road—these pointers are kid specific. With this advice, you’ll help your child safely grow from a bike-seat sidekick to a velodrome champion—well, if that’s what they want to be when they grow up. You can also read riding tips we collected from some of our favorite bike-riding Moms. Before you start adventuring around town with your baby in a bike seat, your child should be one year old. They should be able to hold up their own head with a helmet on and not slump over in the bike seat, according to bikeportland.org. Choose a comfortable child seat with a sturdy harness. Once the child is old enough to unbuckle things, make sure they know not to escape from their harness mid-ride! Start small and bike on quiet streets for short rides so that both you and your baby get comfortable. In addition to putting a helmet on your baby, always wear your own helmet to role model safe biking behavior! Consider a balance bike or push bike. A balance bike has no pedals and helps children focus on first learning to balance on two wheels. Once they have mastered the art of balancing they might be able to skip a pedal kids bike with training wheels all together. After a balance bike, if possible, try to encourage your child to try a pedal kids bike without training wheels. By learning to ride without training wheels, your child will learn balance speed. Keep the seat low so your child can put both feet on the ground. Sometimes it’s easier to start on a gentle slope to get the pedal kids bike moving for balancing and then your child can start pedaling. If your child does not have a lot of riding confidence, a pedal kids bike with training wheels is an option. Training wheels don’t help a child learn the importance of balance speed but they can help a less confident rider get going. All of PUBLIC’s smaller 16″ wheel size pedal kids bikes come with optional training wheels. It might sound contrary, but positioning the training wheels a little higher off the ground than you think will actually create more stability for the child when rolling, says PUBLIC product manager, Aaron Glick. Even though your child is low to the ground, buy your little biker a normal bicycle helmet, labeled with a certification by the Consumer Product Safety Commission. Only let your child explore quiet, safe places—away from dangers such as cars and swimming pools. Allow your children to graduate from a training wheels only once they’ve gained the necessary sense of balance, usually around five to seven years old. Kids at 10-years-old and younger are safer riding on the sidewalk than on the street, according to Safe Kids. Teach your young cyclist to make eye contact with drivers before crossing an intersection. They should make sure that the driver sees them and is going to stop. Try a bike-to-school route! One adult could potentially lead the way, picking up children along the path to school to join the caravan. Ditch the tandem bike. Children should be able to match your pedalling power before they tandem bike, which might take until they reach age 12, according to Outside Online. For long journeys, consider a trailercycle, advises cyclist Charles Scott. You can store your supplies as well as resting children in your trailer. Once they’re ready, kids can get back on the bike and feel like part of the team. Once your kids start pedaling, they might know their way around their neighborhood better than those kids who are only driven around in cars, at least one study has shown. The study also indicated that cycling kids have a richer connection with their community; they remember more spaces where they like to play than exclusively car-driven kids. In that case, what better way to celebrate Mother’s Day than pedaling around your neighborhood together? You’ll give yourself the gift of fun and exercise—and your children the gift of a more memorable childhood. Photography credit goes to the talents of Jetkat Photography. Model credit goes to the beautiful family of Copy Cat Chic. And big thanks to Rebecca Huval for making this post possible. Do You Need a Woman-Specific Bicycle? A woman needs a man like a fish needs a bicycle, as the feminist slogan goes. But does a woman need a women-specific bicycle? The short answer is: No. The long answer is: Every woman, man, and fish that wants to cycle should find a bike that accommodates their lifestyle and feels comfortable in their body proportions. They should shop for a holistically chosen bike—one that factors in their hobbies, health, pregnancy status, affinity for skirts, limb lengths, intended cycling needs and adventures—but not a gender-specific one. Still, you’ll often find women-specific bikes that try to fill a gap in the market. As a female or gender-nonconforming shopper, cycling culture can feel overwhelmingly male. (Women ride bikes only a third as often as men do, according to Jeremy Singer-Vine, data editor at Buzzfeed.) As a result, many bikes on the market cater to traditionally masculine aesthetics and body proportions. The women-specific bikes hope to whisper: It’s OK! You’re welcome, too, in this culture of bike tubes with logos so large, they practically shout. The PUBLIC C7i Dutch-style step-through bike. It’s part marketing, and part functional: Women-specific bicycles aim to fit the female body, accounting for shorter torsos and longer legs by offering women a more upright position. From cycling’s early days in the 19th century, “women’s bike” often refers to a Dutch bike or step-through frame that accommodates full skirts and doesn’t require flashing onlookers while mounting the bike (even though we all might be able to name men who love skirts and women who hate them). Stem length. The stem—the tube that connects the handlebar to the fork on the front wheel—should be long enough to apply pressure on the front wheel and keep control over the steering, especially when you’re going downhill, Bailey says. If your bike is too long, it’ll handle “slow like a limo.” If it’s too small, it’ll be “twitchy” (think: circus bear wobbling on a tricycle). Saddle width. Another stereotypical female body proportion? Child-bearing wide hips. But here’s a bubble burster: “The common belief that women have wider hips than men is not supported by scientific data,” writes Lori A. Livingston in the Journal of Orthopaedic & Sports Physical Therapy. But if you happen to have wide hips, you’ll want to choose a wider saddle. Bailey breaks it down based on what he’s noticed: “Most women run 120 mm to 150 mm with the norm usually at 125 mm. Men have a norm of 110 mm ischial width [Ed. note: that’s “hipbone width,” for you non–anatomy geeks]. I have seen both sexes vary a lot.” In short, measure your body before picking that perfect, $100 leather saddle—only to find out it’s not so perfect for your hips. Image by @mysquirrel at 30 weeks, on her last bike ride before giving birth. Pregnancy. Pregnant women should take extra care, as a fall could be harmful to the baby. “Activities like jogging, using a bicycle, or playing racquet sports might be riskier as you near the third trimester,” warns the Office on Women’s Health, U.S. Department of Health and Human Services. However, some women feel that governmental agencies are overly cautious, and that cycling into the third trimester helped them bear the symptoms of pregnancy. Pregnant riders should raise the handlebars and get a wider, more padded saddle, recommends the British cycling charity CTC. Fashion. Adored by women, men and the Scottish alike, skirts are wearable while riding any bike. In a diamond-frame bike, the top tube keeps the skirt far from the gears. But a Dutch bike will accommodate the full length and girth of any A-line so that it still drapes fashionably over your legs, and you can modestly get on your bike. If you wear light-colored or high-quality duds, you might want to protect them from exposed, greasy gears by choosing a bike that comes with a chain guard. The Diamond frame PUBLIC R24 City Road Bike. Cycling style. Do you want to pedal at maximum speed on a 60-mile ride in the country? Or use your bike for a city commute of just two miles? Different cycling styles will call for different bike fits. With a diamond frame that angles your body more parallel to the ground, you’ll have extra stamina for a longer, faster ride. But upright Dutch bikes might be preferable if you have a short city commute—they give you a better view of your surroundings, including pedestrians and cars. The irony is: Despite the market selling women-specific bicycles, women might actually be better at accommodating their bodies to all sorts of bikes. “Women tend to be more flexible, and sometimes, it’s easier to bike fit them because they have less muscular restriction and usually better hip flexion or less hamstring tightness than men,” Bailey writes. Ultimately, don’t let your gender alone choose your bike. Instead, find what’s comfortable in your body—and your life. We’re all about making the world a more sustainable and healthier place through thoughtful urban design and sustainable transportation. So we got a special kick out of a recent public project in San Francisco that transformed a single car parking spot on the corner of Fell and Divisadero into a bike parking corral for 12 bikes with a vibrant, colorful street mural underfoot. Eric Tuvel in the bike corral. We caught up with the mastermind behind this bike corral mural, Eric Tuvel (pictured above). Read on for more about Eric, how this project came about, and how you can implement a bike corral mural in your city. PUBLIC: You’re both a visual designer and a bicycle advocate? Tell us more about your background. Eric: My background in Graphic Design started in undergrad, which is where I started commuting by bike to class and to get around campus. As I pursued my master’s degree in City & Regional Planning, I began applying my design background to cities and commuting by bike became more about shaping how people move around the city. Before joining the SFMTA (San Francisco Municipal Transportation Agency) as a Transportation Planner in the Sustainable Streets division, I was the Design and Program Manager at the SF Bicycle Coalition. It was there I got more involved in advocacy and the biking community of San Francisco and fused my design/planning background with my love for biking. PUBLIC: What was the inspiration behind this bike corral mural concept? Eric: In my first position at the SFMTA I managed the bicycle parking program. As I started siting and surveying for sidewalk racks and on-street corrals, I started to see the various ways people tried to bring art into these bike parking facilities. Talking with my coworker one day, the idea just hit us and we thought, “What about painting a mural underneath the corral on the street?” It was really serendipitous. Once the idea was planted in my head, I was determined. I started running it by staff at various city agencies to get the approvals I needed. As for the mural that was installed, it was done by Bay Area artist Kristin Farr. She selected colors from the streetscape at the location to come up with the palette for the piece. She was selected by the sponsor, Madrone Art Bar, and was great to work with on the project. The piece is titled “Diamonds on Divis”. PUBLIC: What were the major challenges to getting this bike corral mural implemented? Eric: The major challenge was creating a process for something that hasn’t been done before. The main thing I did was talk to as many people as I could and loop in all the city departments and stakeholders I could think of. It’s a really positive project so overall everyone was supportive but there were some small concerns we were able to work through and got everyone on board. The other unforeseen challenge was the weather! Scheduling a time to paint was a little tricky with the recent fits and starts of rain we’ve had. PUBLIC: How is this project funded? Eric: “Diamonds on Divis” was funded privately by the Madrone Art Bar. They applied for a corral in 2015 and we approved the location. When I came up with the idea, I thought Madrone was the perfect partner for the first one as the corral wasn’t installed yet and Madone is an art bar. I brought the idea to Michael Krouse, the owner, and he was on board right away. I feel lucky that we had a partner that was so easy to work with and was supportive from the beginning. PUBLIC: If you’re an art and bicycle enthusiast outside of San Francisco, what should this person do to replicate a bike corral mural in another city? Eric: First, learn more about what the city process is for something like this. Start with the department that installs bike parking in the city. The process might not be clear, but be persistent and keep talking to folks. Don’t be discouraged by how long it might take because the results are worth the work. PUBLIC: What’s next to expand this concept to other parts of San Francisco? Eric: The next steps would be to evaluate the current bike corral mural, or “bikelet” as I’ve been calling it, over the next few months, primarily to see how it holds up to the elements. We are definitely interested in expanding the program and partnering with other organizations. We encourage interested organizations to contact us and we will be looking into proactively outreaching to businesses that are applying for or already have bicycle corrals. If people are interested they can contact Bikeparking@sfmta.com. Through insightful Facebook comments, glittering Instagram snapshots and daily social media chatter, our PUBLIC community never ceases to inspire. So we thought we’d start a monthly series highlighting an image shared on social media by a PUBLIC rider that caught our eye, and learning a little more about the rider behind the shot. This month it’s Darcy from Fayetteville, AR. She took the photo above of her Slate Blue PUBLIC V7 and we can’t think of a better way to sum up Spring. Thanks for sharing your story, Darcy. We look forward to highlighting next month’s inspiring rider! Chrome tipped front forks and rear triangles were long popular with competitive cyclists as a way to protect their expensive racing frames from getting scratched during quick wheel changes in a race. We tip our hats to the legacy of chrome bicycles by offering this heritage finish across our D model line of premium diamond-frame city bikes, including our single-speed PUBLIC D1, 7-speed PUBLIC D7, and 8-speed internally geared PUBLIC D8i. 1945 Rene Herse Racer, via reneherse.com. Legendary European artisan bike builders like René Herse and Alex Singer would often fully chrome their handmade custom bicycles to lend them both an elevated aesthetic and a durable finish, reflecting the bicycle’s owner investment in quality in commissioning a custom built model. Although chrome was used less often in the later 20th century, some of the most desirable bicycles in the world continued to incorporate signature chrome elements, from the American classic Schwinn Paramount to Italian dream machines from makers like Colgnago and Pinarello. Today, true chrome is rarely found on production bicycles, and only a handful respected names like Bianchi and Soma are keeping this artisan tradition alive. Rarely do the ideals of form and function meet so perfectly in a single design solution. We are proud to celebrate this beautiful, durable, heritage finish, available for a limited time only across our D model line of premium city bikes, starting at just $399. Check out our PUBLIC Chrome bicycles here.